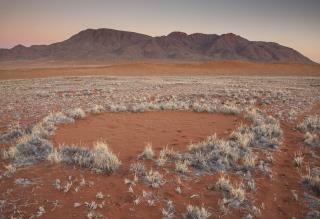 Theory May Finally Explain 'Fairy Circles': Two theories have long been floated to explain so-called "fairy circles" that pockmark the desert in Namibia: either the machinations of termites underground or desert greenery aboveground. Now a new study suggests an interesting third theory: It's not one or the other, but both acting in concert. After Years Without a Mate, Shark Has Babies: Australia's Reef HQ aquarium hoped to scale back its shark breeding program, but Lonnie the leopard shark had other ideas. Over the course of six years, Leonie had produced more than two dozen offspring before she was separated from her mate in 2012. But in 2016, Leonie—who hadn't been introduced to another male—laid eggs that produced hatchlings. How she did it appears to be a world's first for sharks. Vampire Bats Now Feasting on Human Blood: Human encroachment typically means bad news for a given species, but one mammal appears to be fighting back. Researchers say the hairy-legged vampire bat has adapted surprisingly fast from drinking the blood of birds to that of humans to survive. Scientists extracted DNA from 15 samples of feces at a colony in Brazil and discovered human blood in three of them. They usually dine on bird blood, which differs in significant ways. Scientists Say Screen Time Can Benefit Kids: Tapping away on computers, smartphones, and other devices a few hours a day can have beneficial effects on children, a new study found. Despite hand-wringing among experts that kids are spending too much time in a virtual world, the latest research out of Oxford concludes that "moderate engagement … is not harmful." They provide specifics on different devices. Primate Study Finds It's 'Worse Than We Thought': "It's worse than we thought 10 years ago," a researcher says following a major study on the world's primates that found many could go extinct in the next 50 years. Primatologists studied every primate species—all 504 of them—and found 75% are in decline, while about 60% are threatened with extinction, including every species of ape and 87% of lemurs. One of the reasons why has a connection to our cellphones. I'm waiting for a snarky remark from the peanut gallery. Thought so. It's got something to do with the Insects? And water.